Marketing is a process which includes various activities like research, understanding, communication and attracting customers. It is an opportunity to earn profits in the business by spreading the brand name of the company. This process includes a lot of strategy and involvement in making the product liked by the customers. Understanding the requirements of a customer and valuing a customer is another important aspect to be considered in marketing. Marketing helps spread the network of the business and build good relationship with customers. The implementation of creative ideas and perfect strategy will help company to earn profits. A perfect marketing strategy helps in spreading the name of the company and convincing people about the product and the company. To enjoy the profits of marketing, the company needs skillful marketers in order to turn the fantasies of companies into reality. 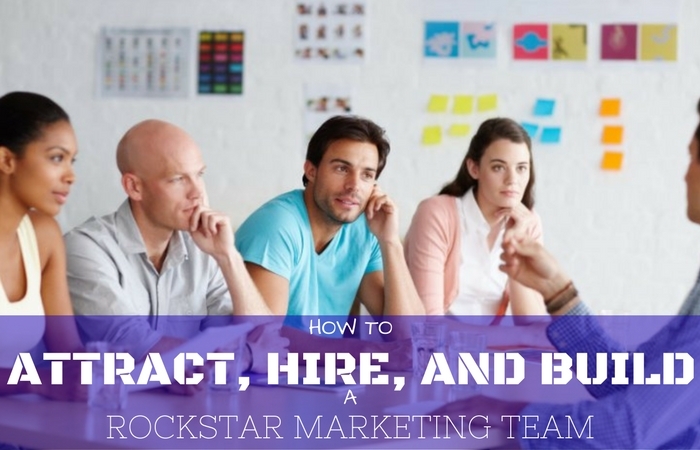 Forming a rock star marketing team which is capable of driving the company towards success is not an easy task. It requires lot of effort, hard work and experience in order to form a rock star team. With so many choices available on the web, advertising about the company and spreading the brand name has become an easy task. There are many data rich social media websites available all over the web which help in advertising. It is a known fact that social networks has become one of the biggest players in advertising. By considering the benefits of social media, it is essential to understand that taking help of social media in hiring process will be helpful to the company. Regular updates about the company and the team should be shared upon the social media. The challenges that company is facing and the strategies that the company is using to face the challenges should be exposed and be clearly mentioned in day to day updates. This helps people to understand that company is putting great efforts in reaching its targets and are likely to get attracted to the company. Appealing pictures of the company and the employees would also help a lot in making people know about the company. Updating vacancies in the networking sites is also good of giving information about the company, the hiring process of the company can also be achieved with ease with the help of social media. In order to remove the woes of the company, it is natural that companies would desire to get candidates who have excelled in marketing. Whenever the company is expecting for best marketing team, then it is expected that the company is also best in its actions. Candidates look for a platform which help them to increase their knowledge and excel in their career. Thus, it is the responsibility of the company to assure people that they are in the right place and their career is in the best hands. Even minor disturbances in the company shows a lot of impact in the decision of employees to join the company. The company has to make sure that the reputation they are building in the industry is good enough to get the employees. Every aspect about the company should be flawless enough for the employees to get attracted. The aspects include payroll, a good team, strategies, challenges and also the company’s vision. The company needs to represent itself in its finest way and make the candidates understand that the company is doing its best to accomplish its tasks. The payroll is the foremost thing that any candidate looks before stepping into a company. The company should be able to offer attractive payrolls to the candidates in order to drive them towards the company. Companies cannot misunderstand that, only high pay checks can attract the best candidates. Although payroll is a vital aspect, it’s not the only aspect which attracts employees to join the company. Candidates also tend to understand the working of the company and the reputation of the company. Providing lump sum amount of money to the candidates without reputation doesn’t accomplish the process of hiring. It is necessary to understand that everyone has their own way of tackling the challenges faced by them. The company should be in an ever learning process in order to understand the ways to tackle a challenge. Employees should be challenged, as the challenges they face bring out the best in the employees. People get excited and become high spirited whenever someone throws a challenge on their caliber. Make employees understand the benefits that, the company would be offering whenever the task is accomplished. Every company works with a strategy to achieve a long-term aim. The ideas and intentions of the company should be made understood to the employees without any hesitation. Companies need to inject the strategy into the candidates who seek to work with the company. They deserve to know the reason behind the efforts and struggle of the company. Involving candidates in the thought process of the company, helps them to feel much secured about the company. By understanding the insight of the company, the candidate will get to know the expectations of the company from an employee and also understands the level of knowledge required by an individual to step into the company. Therefore, it is required to understand that, the vision of the company should also be visualized by the candidate who is about to become an employee of the company. This results in helping the candidate to also visualize the career of the candidate in nearby future. The belief and assumptions on the company will reach to the next level in the minds of candidates and are likely to get attracted to the company. It is natural that experience helps the candidate to learn better, but it also should be understood that experience of the candidate alone cannot help in knowing the abilities of a candidate. There are many candidates who falsify about their experience and misrepresent about themselves to the company. Whenever such fraudulent data is provided to the company, the company cannot just rely on the information written in black and white. Thus, the perfect approach in getting the best people, is to test their caliber but not only their experience. Focus on the actual work done by the employee to understand the potential and abilities of the employee. Review the work of a candidate for a few days to get to know about the capability of the candidate. Whenever in dilemma about recruiting a candidate, the best way to tackle this is by conducting internships. The company can inform the candidate that the candidate will be put under the internship for a few months. Internship is an offer to the candidate but for a limited amount of time. These internships help to make the candidate work on the current project by giving exposure to the real work of the company. Whenever unsatisfied with the outcome of the candidate, the company can end the relationship between the company and employee as an intern. In case, the company is convinced with the skill and capabilities of the candidate, at that instant the company can open doors for the candidate to become an employee. First and foremost, it is vital to consider candidates with high values and ethics. An employee with values and integrity would also help the business to be fair and honorable. A rock star marketing team can only be formed when the members are fair in their practices and still be able to give a tough competition to the competitors. Thus, reliability of an employee helps company to differentiate between an ideal marketer and a normal one. Marketing industry is ever changing. A product which is not in use at present cannot be expected to be sold with the same strategy which has been used earlier. The strategy and the planning should be improved in order to sell the product. The marketing team is expected to be more creative than the earlier, all the times. Creativity is the most important tool which helps to separate an average business from a successful business. Therefore, it is vital to consider candidates who can bring up new strategies and creative ideas which help in increasing profits to the company. It is natural that marketers feel down whenever their implemented idea becomes a failure. A marketer is not supposed to feel low at any times because enthusiasm and positive nature are the assets of a marketer which are needed to excel in the marketing industry. A mistake once made remains to be a mistake whenever not considered as a lesson to learn. The company needs people who learns from their mistakes and moves forward with positive nature and curiosity to learn new things. Therefore, it is important that the hiring manager hires people who are full of eagerness and are optimistic. Another vital aspect in business is communication. There will be lot of internal and external communications. The internal communication happens between managers and the employees. External business happens between clients and customers. The success of marketing business lies in the ability to sell the products to the customers. The information of the product needs to be delivered in a most appealing way so that the customer is willing to buy the product. Communication skills alone are of no use when the words of the employee are not pleasing. The words used by the employee should be as polite as possible. It is required to understand that the main aim of the company is not to force the customer to buy the product but to make the customer willing to buy the product. The customer will be willing to buy the product only when the product is useful to the customer and when it is worth buying it. Thus, it is essential that the marketing team members would know about the product completely and also be able to explain about the product in a most convincing way. The marketing team should be as polite as possible to accomplish the selling process. Thus, it is important for the hiring team to understand that only people who are pleasant in their words and actions could fit into the team. The most efficient way to grow the marketing is first retaining the employees present in the team. Whenever the company is successful in retaining employees for a consecutive number of years, then it is obvious that the company is doing well. Employees are likely to switch companies when they are insecure about the job and assume that the profits the company is gaining, is not sufficient. The company wouldn’t reach too far if the strategies implemented are not sustainable and consistent. Thus, it is necessary that the company implements sustainable ideas which helps in bringing profits to the company. Providing extra benefits for the referrals would make the job much easier. The company has to just be aware of the reputation that the company is building up because It is obvious that every employee wants to work with a successful company. The success of the company is represented in the way employees are treated. It is required to remember that, employees do the main advertising for the company. When an employee is satisfied and happy with the growth of the company, it is natural that the employee would suggest the company to other employees. Thus, it is important to set a great team to grow the great team. Great teams get formed with excellent business strategies. Therefore, focus on the business, then people themselves will focus on the company.